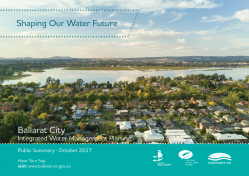 The City of Ballarat, Corangamite Catchment Management Authority, and Central Highlands Water have worked in partnership to develop the Ballarat Integrated Water Management Plan and they are seeking your input and ideas. Ballarat was a city in water crisis at the height of the millennium drought, struggling to deliver its basic drinking water needs. Over the past decade, the planning paradigm has now shifted from a responsive to a systematic approach, generating a series of collaborative projects and initiatives that have alleviated drought impacts and led to the development of the Ballarat Integrated Water Management Plan. With a focus on community and liveability benefits, the plan will create long-term water security to meet future water demands, support local sport, recreation, and industry, and foster a more liveable city with an active and healthy community. Note: Find out more about the projects and initiatives that helped move the region out of water crisis during our Ballarat Integrated Water Management Tour on Wednesday 29 November. Registrations are now open – get in quick!